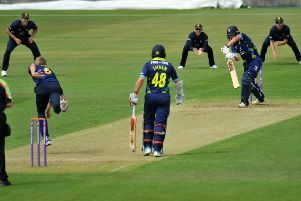 Warwickshire star Bell was outstanding alongside fellow former England man Jonathan Trott, who also notched a ton, as the experienced pair shared a stand of 202 before Bell saw his side through to the victory. Will Smith and Michael Richardson both scored centuries for the home side, but their efforts were in vain. 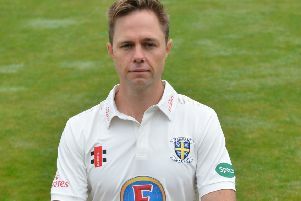 Olly Stone and Keith Barker struck early to remove Paul Collingwood and Graham Clark, after Warwickshire elected to field, while Tom Latham also fell cheaply, for 13. Smith joined Richardson at 54-3. Richardson found his rhythm, although he was dropped by Sam Hain on 47. Richardson made his half-century off 49 balls, maintaining his solid form in the 50-over game. Smith relaxed into his innings, and the pair were able to put Warwickshire under pressure. They reached their 100 partnership off 102 balls before Smith brought up his 50 in style with a massive six off Stone. Durham passed the 200-run mark with back-to-back boundaries from Richardson, who reached his second List A century. The 31-year-old made his highest 50-over score of 111 before he was dismissed, ending a partnership of 161 with Smith. Smith upped the ante to reach his century off 98 balls, including eight boundaries and a six. He fell in the final over for 119, although the home side were still able to post 299-8 from their 50 overs. The Bears were put on the back foot in their reply as Ed Pollock and Sam Hain were dismissed in the opening three overs. However, Trott and Bell proved their quality to stabilise the innings. Trott played with a fine tempo to his innings and was the first to reach his half-century, off 68 balls, and soon brought up the 100 partnership with Bell from 125 deliveries. Bell took slightly longer to score his 50, getting over the mark in 74 deliveries, scoring five boundaries. The experience of the pair took the game away from Durham. The two veterans displayed nous to knock the ball around the ground and dispatch the ball to the boundary when necessary to keep the required rate down. Trott and Bell continued the imperious nature of their batting, reaching the 200 partnership off 207 deliveries. Trott was the first to three figures, calming stroking the ball down the ground to notch his 22nd List A century, although he immediately lost his composure, drilling a Collingwood delivery straight to Richardson. Bell remained focused, though, and brought up his hundred from 108 balls. The dismissals of Adam Hose and Tim Ambrose did not deter Bell as finished his flawless 145 not out with a flurry of late boundaries to secure the vital victory.